We received an exceptionally poignant response to the earlier posting on the Hanyani Disaster. I felt it befitting to share this response with a larger audience. 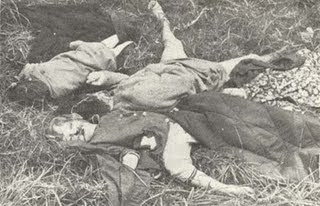 At the same time, I want to draw your attention to the Elim Mission Massacre, which took place in Rhodesia in June 1978. You might ask what relevance any of this has. It goes to show the inherent capacity black Africa has to commit the most barbaric acts of violence against whites. This is the type of fate waiting to befall many South Africans. We would do very well to NEVER forget the treachery and barbarism we have lived with for over three hundred years, and the extremely thin veneer of civility that covers it. And that is our duty. To remember them. All of them. From the frontier farmer killed by the Xhosa in 1700 to Piet Retief to those killed in the Church Street Bombing to the farmer and his wife who were killed last night. Every drop of our nations blood that has been spilled by these stone-age savages will be remembered. WE WILL REMEMBER THEM. ALL OF THEM. Our benevolence and kindness is turning into mourning. When it is finished; when the white man has no more tears to shed; when he has no more good to give; when all his goodness and kindness has been stripped from him; when he has nothing left but hate; there will be a recompense; blood for blood, tear for tear, blow for blow, bruise for bruise, cut for cut. Be warned, the following article is graphic, heart wrenching and achingly similar to the atrocities being meted out on our people everyday, 31 years later. Do not proceed further if you cannot stomach the truth. 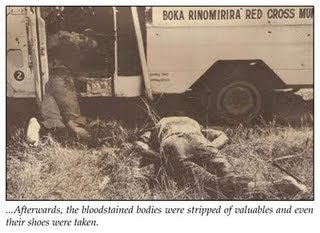 On the night of June 23, 1978, Elim Mission in the Rhodesian Eastern Highlands was subjected to the worst massacre of missionaries yet experienced. Terry Blocksidge reported in the Sunday Mail (Salisbury). 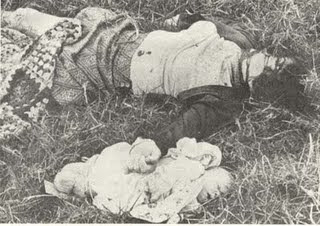 Eight British missionaries and four young children - including a three-week-old baby - were bayoneted to death by terrorists on Rhodesia’s Eastern border on Friday night in the worst massacre of whites since the six-year-old war began. Three of the missionaries were men and the others women. A sixth woman was stabbed and beaten and left for dead. She staggered 300 m into the freezing Vumba bush to spend the night before being found semi-conscious by security forces yesterday. Despite intensive care in a Salisbury hospital she subsequently died. The gruesome murders, by a group of eight to 10 terrorists, happened at Emmanuel Mission School - 15 km south-east of Umtali and 8 km from the Mozambique border - once used as the Eagle boarding school. * Mr. Peter McCann (30), his wife, Sandra (also 30), son Phillip (6) and daughter Joy (5). * The Rev. Phillip Evans (29), his wife, Suzan (35), and their daughter Rebecca (4). * Mr. Roy Lynn (37), his wife, Joyce (36), and their daughter Pamela Grace. She would have been three weeks old yesterday. * Catherine Picken (55) and Elizabeth Wendy Hamilton- White (37). 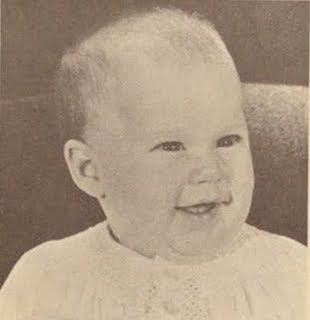 * Miss Mary Fisher (28). Most of the women had been sexually assaulted, and one mutilated. The children had been dragged from their beds. Two children were in yellow pyjamas, one with a red dressing gown, and a third in a flowery nightdress. One child had her tiny thumbs clenched in her palms. Even hardened security men were stunned by the bloody scene and stood around silently. “The quiet is uncanny”, said one. Nearby, another woman had died from an axe-wound - the weapon still protruded from her shoulder and two men, one with his hands tied behind his back, lay beaten and slashed to death. 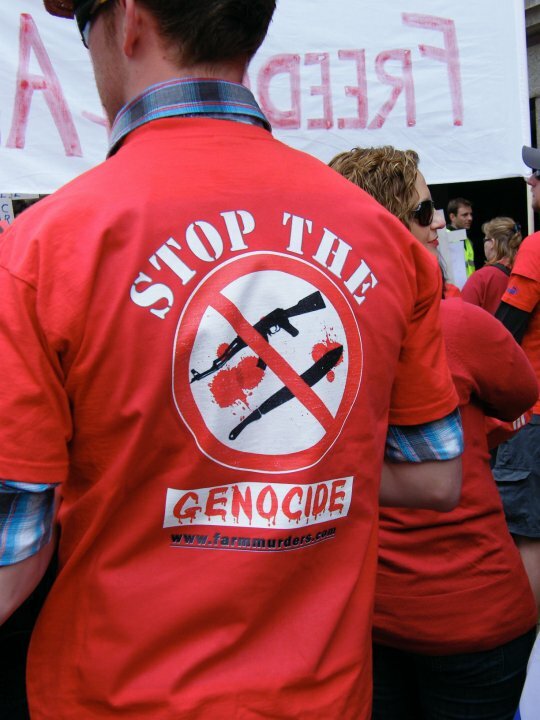 Non-violence in many ways is being practised by the Patriotic Front. I asked one of their commanders, Tongogara, what they actually do in Rhodesia, and he said they’re not doing much fighting, except when they are fired upon, or when the Rhodesian defence forces find them and try to run them out. So says Mr. Andrew Young, United States Ambassador to the United Nations, in a recent interview with the London Times. This weekend, in the worst atrocity committed against white civilians in the history of Rhodesia’s six-year war, terrorists of Robert Mugabe’s Zimbabwe National Liberation Army hacked and battered to death almost the entire white staff and their families at the Elim Pentacostal Mission in the Eastern border mountains. This weekend, when local and international journalists arrived at the scene of the massacre 15 km from Umtali and less than 7 km from the Mozambique border, the mutilated and blood-stained bodies of three men, four women and five children - including a three-week-old baby - were lying as they had been found that morning. Shocked and angry troops viewed the carnage and quietly cursed the terrorists. One man had tears in his eyes as he muttered: ‘The bastards. They are nothing better than animals. How could they do this? Yet these are the terrorists whom men like Andy Young support. It is that terrorism has been given respectability. That the men with the guns are regarded as freedom fighters, as liberators, when they are no more than thugs and animals. When will the World Council of Churches appreciate that it must stop aiding men who kill and maim the innocents? When will our local political priests accept that it is time to condemn, instead of support, such forces of evil? When will Mr. Andy Young and people like him realize that every man, woman or child who dies at Elim or at Kolwezi, or anywhere else on this dark continent, is a victim of insensate hate and barbarism? When will they back the forces of peace, of tolerance, of goodwill, instead of supporting the brutal and beastly terrorists? "They killed my sister for a cellphone, and also nearly killed my brother-in-law. It was the worst day of our lives." These were the words of a distraught Hane Rumsey, whose sister Isabel Schonken died on Saturday after being shot in the heart on a smallholding in Welbekend, east of Pretoria. Her husband, Lars, is undergoing surgery at the Life Little Company of Mary Hospital in Groenkloof today. A metal plate will be surgically inserted into his skull in an attempt to repair the open fracture he suffered after being hit over the head with a blunt object during the attack. At about 2.30am on Saturday, Schonken's eldest daughter, Sonija Smit, who lives with her husband Thinus in a house on the same plot as her parents, received a call from her father, telling her there were robbers in their house. Thinus went to investigate. But the robbers had already fled with Schonken's cellphone, leaving Thinus with the grim task of assessing the 56-year-old Lars's injuries. 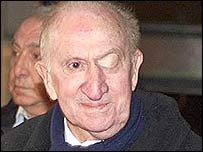 When Thinus found Lars, he was bleeding profusely from a deep head wound and asking where his wife Isabel was. Thinus found 55-year-old Schonken lying dead on the floor of the guest toilet, near the front door of the house, shot through the chest. "My first priority was to get Lars to the hospital as fast as I could," Thinus said, adding that after he notified the police, he put his injured father-in-law into his car and drove to Wilgers Hospital. Rumsey, who also lives in a cottage on the property, said there was an attempted break-in two weeks ago. She said that on Saturday the whole family had been caught off guard. "I did not hear a thing throughout the whole incident - not a gunshot, or a dog barking, or anyone screaming. I only woke up just before Sonija phoned me. It was the strangest thing," Rumsey said. Lars was beaten badly with what seems to have been a wooden object with some sort of metal tip. At some stage during the attack, Lars regained consciousness, opened the safe and shot at one of the robbers. It has not been confirmed yet if the robber was injured but a source close to the investigation said Lars had hit and injured one of them. Rumsey said it appears as if Schonken had fallen asleep in front of the television and was woken by a gunshot. She added that despite electric fences and motion detection alarms on the property, the robbers managed to gain entry into the house. "These guys knew exactly what they were doing. They have been watching our movements on the plot for a while now," she said. Rumsey said her sister was a "very" strong character. "It is a great loss to the family. The family is trying to be strong through this difficult time. All we can do is take it a day at a time," Rumsey said. Smit said they were still waiting for the autopsy results. "It's a very difficult time for us children. But we are dealing with it as best we can," she said. Schonken leaves behind her eldest child and only son, Francois, and three daughters, Smit, Karin, and Alma. Police spokeswoman Inspector Sanet Lourens said no arrests had been made. Lourens said Bronkhorstspruit police had asked for and received three more police patrol cars from Pretoria to clamp down on the recent spate of violent crime in the rural areas around the city's east. "We are monitoring the situation and want to ensure the greater Bronkhorstspruit, Boschkop, Cullinan and Welbekend communities that we are doing our best to bring the perpetrators of these violent crimes to book," said Lourens. Meanwhile, Barry Bateman reports that Robert Anderson, 47, who was shot during a robbery at his home near Bronkhorstspruit, is "doing very well" following surgery on Friday. Anderson's son James, 18, was shot dead in the incident which took place at about 1am on Friday. Anderson was shot several times in the upper body. James ran to his parents' bedroom and struggled with the gunman. A second gunman shot him in the back. He died on the scene. Vandeesweek het ds. Nico Smith, ‘n soort sikofant van oorle Beyers Naudé, ‘n kat in die hoenderhok gesmyt met sy stuk in Beeld waarin hy blankes tot onderdanigheid aan hul nuwe swart heersers maan. So nie, sê Smith, gaan dieselfde lot ons tref as die sowat miljoen Franse Algeryne wat almal sak en pak met net die klere aan hul lywe hul land moes verlaat toe die moederland, Frankryk, hulle in die steek gelaat het en sy militêre magte verwyder het. Met ander woorde, ons moet aanvaar dat ons en ons kinders en waarskynlik ons kleinkinders, vir altyd tweederangse burgers onder ‘n swart regering gaan wees wat ons bloot gaan verdra na gelang van ons onderdanigheid en die “lojaliteit” wat ons jeens hom gaan betoon. Tereg het Tim du Plessis, die redakteur van Beeld wat deesdae toenemend ontnugter met sy base by Naspers se utopiese voorstelling van “Suid-Afrika se wonderlike demokrasie” raak, ‘n teenargument geopper wat ek reeds jare lank ophaal: wat het hul onderdanigheid die blankes van Zimbabwe en veral die Commercial Farmers Union gebaat? Hulle het agteroor gebuig, hulle was lojaal en inskiklik, maar op die ou end het Mugabe dit as swakheid geïnterpreteer. Hulle grond is summier onteien en van die eertydse groot blanke bevolking van etlike honderde duisende mense in die voormalige Rhodesië het daar net mooi niks oorgebly nie. Vyftien jaar nadat die Broederbond, die Nasionale Party en veral Nasionale Pers met sterre in hul oë Afrodemokrasie verwelkom het, lyk dit asof die werklikheid soos ‘n swartman met ‘n AK-47 in iemand se inrypad opdoem. Smith weet waarskynlik nie veel van die Franse geskiedenis nie, want wat hy nie noem nie, is dat die Algerynse kwessie ‘n geweldige politieke twispunt in Frankryk self tussen Links en Regs ontketen het. Uiteindelik het Frankryk die “oorsese Franse” in die rug gesteek om die land self van ‘n moontlike burgeroorlog te red. Die Franse Algeryne kon die militêre stryd gewen het, net soos Suid-Afrika die ANC militêr kon vernietig het indien die ou regering maar net oor die politieke wil beskik het om dit te doen. Wat het die lugmag destyds met sy 300 Mirages en uitstekend opgeleide vlieëniers verhoed om die ANC se kamp naby Lusaka met die grond gelyk te maak? Op dieselfde manier was die Portugese in Angola besig om die militêre geveg teen die MPLA te wen toe ‘n nuwe linkse en revolusionêre regering ná die sogenaamde Angelierrevolusie in Portugal aan bewind gekom het. Daardie regering het sowel Angola as Mosambiek aan die radikale, Marxistiese “bevrydingsbewegings” oorhandig, wat agterna alle blanke eiendom onteien, blanke vroue verkrag en die Portugese holderstebolder uit die land laat vlug het met dít wat hulle in hul tasse en hul motors kon laai. Afrikaners en blankes beskik oor ‘n moontlike voordeel in dié sin dat ons nie meer oor ‘n moederland soos Frankryk of Portugal beskik wat ons kan verraai nie. Ook Brittanje, wat tradisioneel teen Afrikanerselfbeskikking en -vryheid gekant was en wou toesien dat ons deur die Zoeloes en Xhosas oorheers word, is besig om ekonomies en militêr te taan as gevolg van sy Noordseeolie wat opraak. Brittanje kan dus nie meer sy wil op ons afdwing soos hy in die laat tagtigerjare gedoen het toe hy die radikale ANC as enigste politieke erfgenaam vir Suid-Afrika voorgehou het nie. Die feit dat Nico Smith nou die moontlikheid van blanke vlugtelinge wat met net die klere aan hul lywe die land sal moet verlaat aan ons voorhou – en dit nogal in Beeld – wil vir ons sê dat die aftakelingsproses eintlik al ver gevorder is. Wat Nico Smith aan ons oordra, is: julle het nie meer enige regte nie, die grondwet was ‘n foefie van De Klerk en kie. om julle te kry om van die weermag afstand te doen en nou is julle magtelose vlugtelinge in jul eie land. Aanvaar dit en wees onderdanig. Eintlik is julle slawe van die swart regime en te onnosel om dit in te sien; vandaar julle gemor oor minderheidsregte, die afskaffing van regstellende aksie en meer staatsbeskerming teen geweldsmisdaad. Ná die Brandon-Huntley-geval in Kanada het blanke volksmoord egter skielik baie aktueel geraak. Indien ‘n Westerse regering – en dit nogal in ‘n liberale land soos Kanada – die gedagte van blankes wat deur swartes op grond van hul ras vervolg word, ernstig opneem, dan prikkel dit nogal die verbeelding. Selfs Thabo Mbeki, Meneer Swartnasionalisme self, het nou die dag die V-woord gebruik toe hy gesê het dat die huidige rasgeoriënteerde denke van die ANC op volksmoord mag uitloop. Allerlei webwerwe waarin blanke, Afrikaner- en Boerevolksmoord bekla word, skiet by die dag soos paddastoele op, wat vir ons aandui dat die temperatuur in die land besig is om te styg. Mense soos Nico Smith en Julius Malema is eintlik vir ons ‘n aanwins, want hulle praat reguit. Oor die afgelope anderhalf dekade en meer is ons so bewierook met Amerikaanse en Britse begrippe van rasseharmonie, multikulturalisme en natuurlik Tutu se “reënboognasie” wat hy net so by Jesse Jackson geplagiariseer het, dat baie van ons mense hulself steeds in ‘n gekkeparadys bevind. Hulle dink dat Suid-Afrika skielik ‘n Skandinawiese land geword het, ‘n eksperiment in menseregte en verdraagsaamheid, terwyl niks eintlik hier verander het van die dae toe Piet Retief en sy manne doodgemartel is en die Voortrekkerbabas se harsings agterna teen die wawiele uitgemoker is nie. Die sogenaamde “debat” rondom ‘n moontlike bedreiging vir blankes wat daar nou in die Nasperskoerante plaasvind – ek sien Harald Pakendorf en Max du Preez kef ook vandag halfhartig in Rapport agterna – sal binne ‘n week of twee weer oorwaai. Daarna sal ons weer gebreinspoel word met al ons menseregte onder die wonderlike grondwet, wat regters Hlope en Motata dalkies vir ons gaan bewaar, en hoe dankbaar ons teenoor die grote ANC behoort te wees. Nico Smith mag, soos Max du Preez en Christi van der Westhuizen en al die ander ekstremiste wat vandag in dié deurmekaar land as hoofstroomjoernaliste gereken word, ‘n malletjie wees. Maar hy is ook nie só mal nie. Gerugte wil dit hê dat hy lankal nie meer in Mamelodi tussen sy swart lidmate woon nie, maar in Pretoria-Oos tussen blankes. Met sy een voet in die swart wêreld en die soort mentaliteit wat daar geld, wil Smith vir ons waarsku dat ons nie moet dink dat ons met ons huidige “voordele” in die vorm van ons huise, plase en ander besittings, permanent gaan wegkom nie. Een of ander tyd, as ons houtgerus en op ons swakste is, gaan die ANC eenvoudig à la Mugabe die finale bedryf in sy bevrydingsdrama aankondig en sal ons soos die Algeryne uit die land gesit word of eenvoudig op ‘n groot skaal uitgewis word. Maar die paaie lughawe toe mag verstop wees en daar sal nie genoeg vliegtuie wees om ‘n lugbrug vir vier miljoen blankes te verskaf nie. Vandaar dus die volksmoordscenario wat nou skielik by almal – selfs die liberales – begin spook. “Sou dit tot ’n massa-aanval op al wat wit is, oorgaan, sit die wit mense vasgekeer soos rotte in ’n val. Hulle het geen moederland wat skepe sal stuur om hulle te verwyder nie. Hulle sal ’n massaslagting moet verduur. Maar wat dan van die leër en die polisie? Waarom sou hulle vir die wit mense ter beskerming intree as hulle 15 jaar lank nog net kritiek vanuit die wit oord moes verduur? En wat van die VSA en die Verenigde Nasies? Ons moet onder geen illusie verkeer nie: die Britte, die Amerikaners met hul swart president, die Franse, die Duitsers, selfs die Hollanders wat nou al hoe meer na regs swenk, voel vere vir ons. Hulle sal hande gevou sit indien daar hier ‘n menseslagting teen blankes op die skaal van Rwanda – daardie ander “wonderwerk” uit 1994 – sou plaasvind. Al wat die Verenigde Nasies en die Veiligheidsraad sal bydra, sal ‘n debat wees oor die vraag of ons dit verdien, aldan nie. Miskien sal hulle – soos in Zimbabwe – na afloop ‘n paar sakke mieliemeel vir die swart armes stuur wat nou sonder hul wit boere en voedselprodusente moet klaarkom. Maar vir ons sal hulle geen vinger verroer nie. Dis die ongelukkige – en harde – waarheid. Ons is suiwer op onsself aangewese. Sodra ‘n mens egter onder hierdie verskriklike besef kom, begin die geskiedenis baie hard met jou praat. Was ons nie nog altyd aan die genade van Afrika se oorlogsugtige stamme uitgelewer nie? Binnekort verskyn daar by PRAAG ‘n heruitgawe van Paul Kruger se biografie deur D.W. Krüger. Ek hoop dat soveel as moontlik mense dit gaan lees. Want gedurende die hele negentiende eeu is ons aan die een kant deur die Britte en aan die ander kant deur Silkaats, Dingaan, Makapaan, Mosjesj en allerlei moorddadige swart leiers en hul volgelinge geteister. Gewoonlik het die Britte ook swartes teen ons opgesteek en terseldertyd enige kruitinvoere deur Boere via hul hawens in Natal en die Kaap verbied. Hoe meer dinge verander, hoe meer bly hulle dieselfde. Oor die afgelope 250 jaar en meer is ons lewens nog feitlik elke dag bedreig. Ons leef nog altyd onder Damokles se swaard en die feit dat ons in 1994, danksy die wonderlike insigte van mnr. De Klerk en die spul kruipers waarmee hy hom omring het, ons weermag verloor het, is ‘n terugslag, maar nog nie ‘n ramp nie. Die ANC is ‘n oorlogsparty. Sy hele denke, retoriek en sin vir intimidasie en geweldsdreigemente, is deurtrek van oorlogsug. Wat Nico Smith ook vir ons probeer sê, is dat indien daar ooit vrede in Suid-Afrika gaan wees – hoewel dit nooit ‘n geweldlose vrede gaan wees nie – sal dit geskied op voorwaarde dat ons daagliks voor ons heersers moet neerkniel en onsself moet verneder. Immers sien hulle nie, anders as wat mnr. De Klerk en die Nasperskoerante ons wil wysmaak, 1994 as ‘n “onderhandelde skikking” nie, maar as ‘n verowering. Ons is verower en die verowerde beskik oor geen regte nie, allermins die reg op eiendom, op taal en kultuur, om van gelykheid nie eens te praat nie. Dit is hoe die ANC en waarskynlik ten minste die helfte van die swartes in die land – veral dié wat steeds aan die Ooskus woon – dink. Wat het Paul Kruger-hulle ná 1877 gedoen toe sir Theophilus Shepstone en die Britte hul land geannekseer het? Hulle het begin weier om belastings te betaal. Dit het vanself ‘n plofbare situasie geskep wat op oorlog uitgeloop het. In teenstelling met dominee Nico Smith, dink ek nie dis nou die tyd om briek aan te draai en die swartmag minder met kritiek en klagtes te irriteer nie. Dis juis nou die tyd om hulle te druk dat hulle oë traan. Deur magte van buite, die Britte, Swede en VN met hul sanksies en aanstook van terreur in ons land – asook deur De Klerk se verskriklike kortsigtigheid – is ons in hierdie situasie gedompel. Ons het hierdie stryd en hierdie oorlog nie gekies nie; ander het dit oor ons gebring. Ons is magteloos, maar ook nie so magteloos nie. Ons was nog altyd ‘n minderheid en ons het nog nooit in ons geskiedenis – behalwe vir ‘n dekade of twee toe P.W. Botha minister van verdediging en later president was – behoorlike wapens gehad nie. Nietemin het ons telkens as dit nodig was en ons in ‘n hoek gedryf was, met die hulp van Bo, oorwin. Al moet ons nou soos die wiskundenavorser in die rolprent Straw Dogs met potte warm kookolie vanuit ons huise veg, veg sal ons. Vele ANC-woordvoerders soos Mokaba of Malema het nou al soveel keer met geweld gedreig dat ek begin dink hulle bluf net. Dominee Nico Smith dink kennelik hulle is ernstig, maar of hulle bluf of gaan aanval, maak eintlik nie saak nie. Want ons situasie gaan nie verander nie. En solank ons in hierdie situasie van magteloosheid en uitgelewerdheid verkeer, sal ons op ons hoede moet wees. Ek wil nie soos die Boeremag klink nie en assosieer my ook nie met aggressiewe en onwettige pogings om die grondwetlike orde te verander nie, maar ons moet oor ‘n “gebeurlikheidsplan” beskik vir die dag as die ergste dalk wel plaasvind. In elk geval ervaar ons tans ‘n graad van geweld en rasseaanvalle wat reeds ‘n volksmoord genoem kan word. Ons hanteer dit verbasend goed, maar moet besef dat dit moontlik net die begin van ‘n groter offensief kan wees. En daarvoor, in dominee Smith se gevleuelde woorde, moet ons “pas op”. As u na hierdie nuuskommentaar luister, moet u uself as ‘n baie gelukkige persoon beskou. Dit beteken dat u nie een van vyftig mense is wat die afgelope jaar elke dag vermoor is nie. Dit beteken ook dat u nie een van die vyftig huiseienaars daagliks is by wie daar ingebreek is en u radio weggedra is terwyl u dalk bloeiend, aangerand of half doodgeslaan in die badkamer vasgemaak was nie. Dit beteken dat u ook nog radio in u motor kan luister, en dat u nie een van die een en veertig mense daagliks is wie se motor gekaap is nie. Dit is die realiteit van die ANC-Suid-Afrika, soos dit gister oopgevlek is toe die misdaadstatistieke uiteindelik vrygestel is. Met dié skokkende statistiek is dit nou heel verstaanbaar dat die huidige adjunk-president van die ANC, Kgalema Motlanthe, in sy tyd as president vroeër vanjaar besluit het om nie hierdie statistiek voor die algemene verkiesing bekend te maak nie. Die afname van 1,8 persent in moordgevalle is weglaatbaar. Om te wil juig oor ‘n afname van 339 moorde oor ‘n tydperk van ‘n jaar, terwyl daar steeds byna 18500 mense vermoor is, grens aan die absurde. Die enigste rede waarom daar ‘n algehele afname in die getal moorde is, is omdat daar ‘n 17 persent afname was in die Wes-Kaap en ‘n 7,5 persent afname in die Oos-Kaap. Maar in Oos-Transvaal het moorde met ‘n stewige 8 persent gestyg, in Noord-Transvaal met byna 8 persent, in Sentraal Transvaal met 5,7 persent, en in die ander provinsies was daar ook stygings. Huisrooftogte het skrikwekkend gestyg. Die provinsie waar die styging die minste was, is Sentraal-Transvaal, waar die styging “slegs” 11 persent was. Maar in die Noord-Kaap het huisrooftogte met 275 persent gestyg, in die Oos-Kaap byna 129 persent, in die Vrystaat byna 128 persent en ook die Wes-Kaap is nie dié euwel gespaar nie, een meer as 22 persent méér huisrooftogte het daar voorgekom. Rooftogte by sake-ondernemings het ook drasties gestyg. Die feit dat nie méér mense tydens die verskillende rooftogte dood is nie, kan byna as blote geluk geskryf word, want in baie gevalle word mense geskiet, gesteek, aangerand en gewond. Daar is dus geen rede vir enige gerustheid nie. Die situasie is erger as in die meeste oorloggeteisterde lande. Hierdie statistiek kan ook nie meer op Thabo Mbeki en sy minister van veiligheid en sekuriteit se brood gesmeer word nie. Die grootste tydperk was onder die huidige minister van polisie, wat al deur Motlanthe aangestel is nadat Mbeki “herroep” is. Ons moet dus geen valse hoop koester dat onder Zuma en sy minister dinge beter gaan nie, want duidelik gebeur dit nie. Daar kan nog baie oor die misdaad gesê word, maar dit sal ons net warm onder die boordjie maak. Die belangrikste is om te besef dat ons ons belastinggeld mors, want die staat gebruik dit nie om sy inwoners te beskerm nie. Ons sal een of ander tyd ernstig moet begin besin oor die hele kwessie van belastingbetaling aan die staat, vir dienste wat nie gelewer word nie. Voorts moet ons besef dat ons ons asem mors om die regering daarop te wys dat dit sy grondwetlike plig is om ons te beskerm. Hy doen dit al vyftien jaar lank nié. Ons sal dit self moet doen. Ons sal nog meer paraat moet word, onsself moet laat oplei om huis en haard te beskerm en te verdedig, betrokke raak by mekaar, en mekaar beskerm en mekaar se belange op die hart dra. Bowenal sal ons weer eens moet besef dat hierdie nie die soort bestel is wat strook met ons kultuur nie, en dat ons dringend moet kyk na ‘n alternatief. Om te dink ons kan hierdie land “maak werk” en ‘n leefbare situasie kan help skep, is, met alle redelikheid, ‘n hersenskim – pragmatiese wensdenkery. TWO teenagers arrested for the murder of a 78-year-old librarian in Wittedrift, Plettenberg Bay, apparently stabbed her to death after she made them sandwiches. Wittedrift Dutch Reformed Church pastor Chris du Preez said the two boys, aged 16 and 17, from the adjoining township of Green Valley, had frequently visited Johanna Blignault at her home, where she gave them food. Police who found Blignault’s blood- soaked body outside her back door also found evidence suggesting she had made them sandwiches in her kitchen on Saturday afternoon. A bloody knife was found at the scene. The boys were ordered to remain in custody when they appeared briefly in the Plettenberg Bay Magistrate’s Court yesterday. Police said their case was postponed to Tuesday next week for a bail application. Evidence was also found to suggest Blignault had been raped, but police said a post-mortem would be conducted today to establish the facts. The two suspects used R150 they allegedly took from her purse to buy alcohol and were drinking at the home they shared with the grandmother of one of the boys in Green Valley on Saturday night when police arrived to arrest them. A DVD player was found with the two youths after police earlier found a radio and frozen chicken, also allegedly from Blignault’s home, in bushes outside the grandmother’s house. Both youths had previous brushes with the law. One was out on bail and was to be sentenced yesterday on a charge of housebreaking, while the other was serving a suspended sentence for stealing a car. After the murder Du Preez set up a Facebook site for Blignault, and by yesterday 102 people had already joined. “I did it to provide a forum for people to express their sorrow and anger. It is better to talk about this than not,” he said. Du Preez said Blignault was “a real community leader who served as Wittedrift librarian for more than 50 years without remuneration”, and was loved by the community. Du Preez praised the police for their “sterling work” and quick response to the crime scene. Plett’s head of detectives, Superintendent Zola Zatu, was also singled out for praise. Blignault’s son, Jeffrey’s Bay attorney Ernie, said yesterday his mother was “a very soft, well- loved person”. He said his mother had chosen to stay in Wittedrift after her husband George, a teacher at the local high school for 35 years, passed away 13 years ago. She is survived by her son Ernie, 50, and daughters Gene, 45, and Helena, 51. She will be buried in Wittedrift on Friday. The Wittedrift community was still in shock yesterday, but everyone contacted attested to Blignault’s generous spirit. 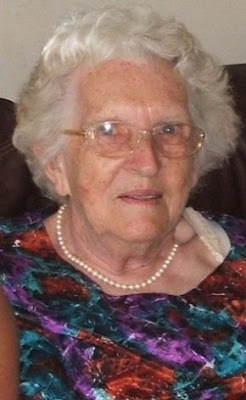 A neighbour, who asked not to be named, said she was the first to come across Blignault’s body after the elderly woman failed to answer her telephone. Karen Nagel tried to keep armed robbers from entering her home - but as she struggled to close the door on them one stuck a pistol through the opening and fired at her. Now just three days after her son, Johan Nagel, celebrated his 23rd birthday he is at her bedside where she was last night declared brain-dead. Doctors at Glenwood Hospital in Benoni expected to get a second opinion on her diagnosis late last night. Karen and her husband, Jan, were watching television at about 9.30pm in their Springs home on Saturday night when their three dogs suddenly started barking in the backyard. Karen went to investigate and Jan came after her. When she reached the patio she noticed some men just outside the sliding door leading to the backyard. Shouting for her husband, she struggled to slam shut the door while the men wrestled to keep it open. Jan had grabbed a poker from the fireplace and was rushing to his wife's aid when one of the men stuck a pistol through the opening in the door and fired at Karen. The bullet hit her in the back of her head. The men then fired a shot at Jan, then fled. The first shot missed him prompting the men to turn back and fire a second shot which grazed his right arm before lodging in the roof. It is suspected five shots were fired in total with .45 calibre and 9mm pistols used in the incident. Nothing was taken after the shooting. Karen fell in the doorway and her husband made her comfortable on the floor before phoning their son. Their relatives who live down the road rushed to their house after hearing shots. Some rushed to the backyard and through the back gate to follow the suspects. Although only two were seen at the house, five men were seen running away into the veld. The police have been accused of responding late allowing the robbers time to flee. Police spokeswoman senior superintendent Noxolo Kweza said the allegations about the police's actions would be investigated. Johan arrived 15 minutes after his father's call and found Jan cradling Karen on his lap. At the time she was still conscious and communicated with her family in gestures. Shortly after the incident, Johan, Jan and other family members started calling 10111, 112 and 911. Paramedics arrived at about 10.30pm and tried to stabilise Karen before she was taken to Glenwood Hospital in Benoni. The first police unit arrived only 45 minutes later. Last night, Karen was kept on life support while tests were being done to ascertain whether there was any chance of saving her life.